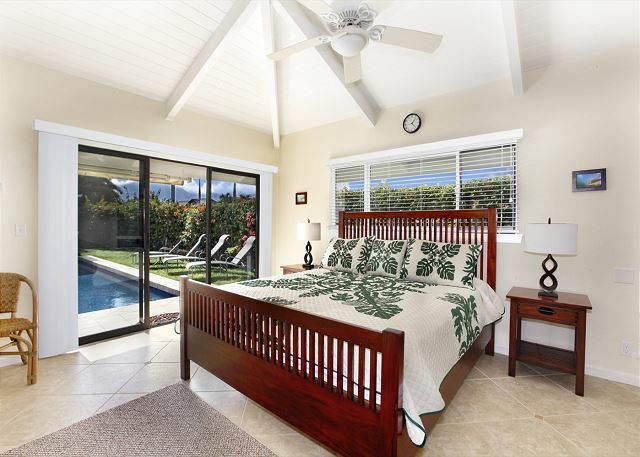 One of Princeville's finest vacation rentals, Nalani Palms provides peace, privacy and comfort for your ultimate dream vacation. Grill local fish on the stately BBQ, lounge by the private pool or watch the sunset from the upstairs lanai. 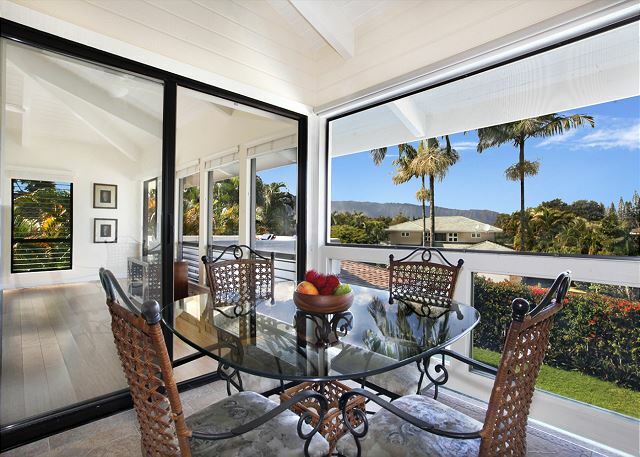 The luxurious possibilities of this home are sure to create magical memories that will last a lifetime. 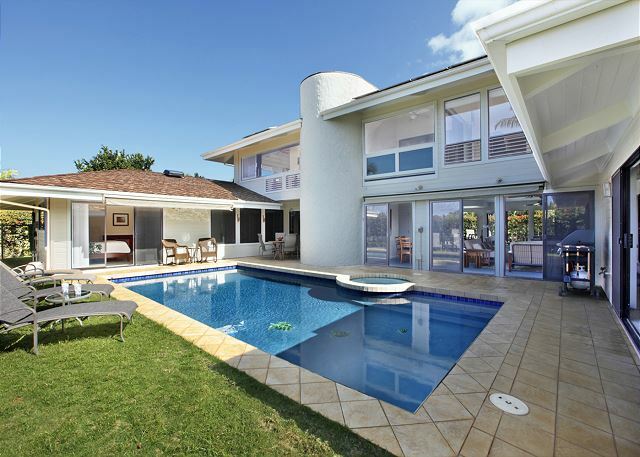 This 5 bedroom, 4 bath house comes fully equipped with a game/entertainment room, hot tub, pool, beach gear and paddle boards. Tastefully and elegantly furnished throughout, the pristine atmosphere is a welcoming space to indulge after a day of adventuring! 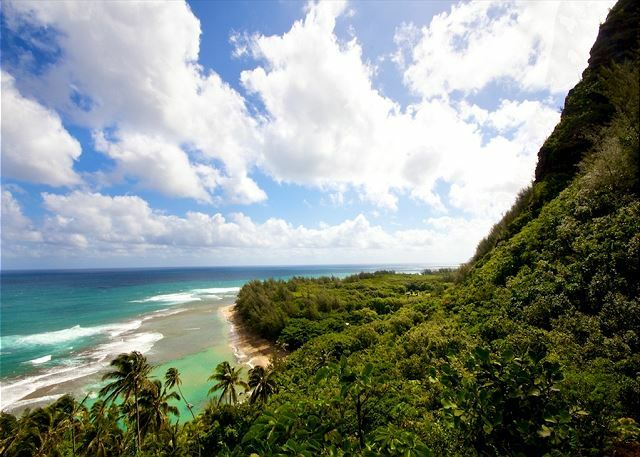 This prime location allows you to enjoy all of the amenities Princeville has to offer, plus a close proximity to some of the North Shore’s most stunning beaches. We really enjoy our stay in this beautiful home. It was perfect for our six adults and four children. It was fully stocked with everything we needed including the beach equipment. The kids loved the game room and the ping pong table in the garage. 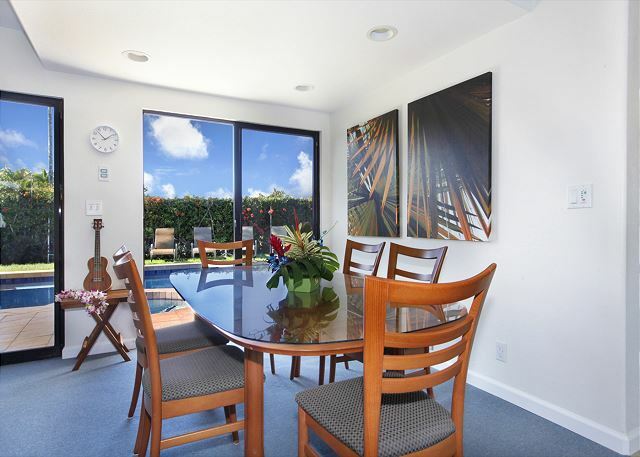 The location was perfect, within walking distance to a park, grocery store and restaurants. The pool and spa was wonderful and the kids were in it every day. Great home for a family reunion. 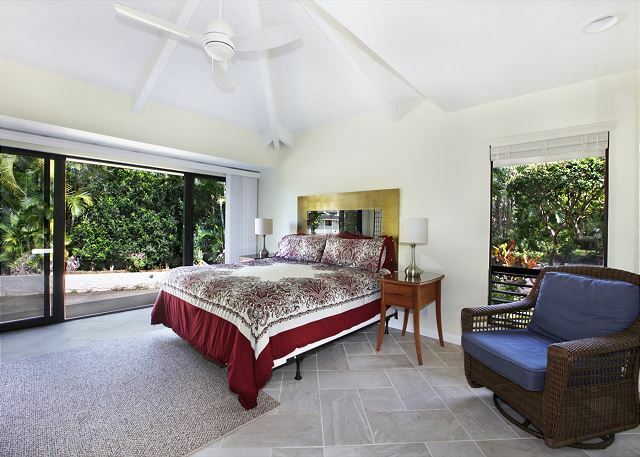 Bedrooms are large so you have your space and king size beds! Bedrooms are downstairs and living/kitchen upstairs. 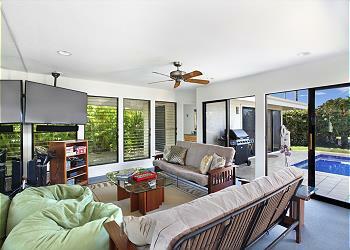 Home has a large number of beach items to use in the garage. So no need to rent items. Pool was a little cool but jacuzzi warmed up nicely! 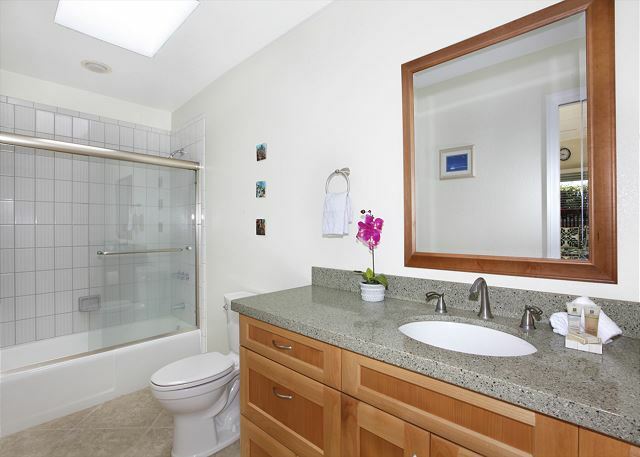 Location is super convenient to grocery store, shops and town. And walking distance to a Tiki bar!! Would have loved to see more kitchen towels and a bit more updated kitchen items. Outdoor BBQ was great. Management company was easy to work with and super responsive to our needs. Only complaint would be the roosters but that's Kauai! Overall great time and awesome location! Such a great stay, everything was as expected. Beautiful location, shopping center nearby, and the house was of course beautiful and plenty of space for our 11 guest party. I also received a sweet wedding present from management. Definitely recommend! Our family of 8 adults, 2 kids and 1 baby stayed here comfortably for a week. Rooms were spacious, beds super comfy and was great to have everyone have their own bathroom. Master suite is incredible - pictures don't do it justice. The staff was great and questions were answered super fast. There was a ton of equipment there to use (beach chairs, surfboards, snorkels, water shoes, boogie boards, etc), Short walk to the business centre with groceries, shaved ice and tour booking services. The kitchen was very well stocked - recommend you check it out before you go by any staples. Ping pong table was damaged and missing during our stay, but other than that everything was in good working order. Having a private pool was so great for everybody. There is no air conditioning, but ceiling fans and tables in every room. 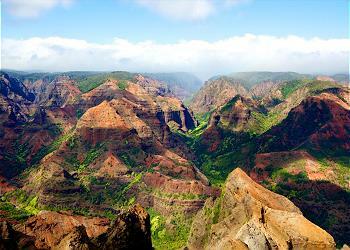 Only downside was there are some bugs and the occasional gecko that find their way in, but that is life in Kauai. Would go back in a heartbeat! Very nice large home, Some minor damage was noted that had occurred prior to our arrival. But overall the house was perfect. The neighborhood unfortunate didn't allow any sort of fun having me an my wedding party shut down for noise at 730 pm. The house was perfect for our two families. Plenty of room with a large living room and kitchen and a game room downstairs. The pool provided a great spot to relax after a day of exploring and the ping pong table was super fun. 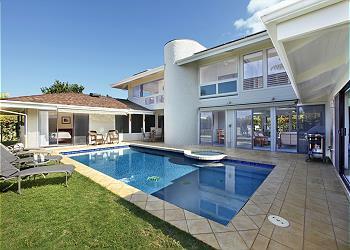 The house also came with tons of beach gear - SUPs, surfboards, bodyboards, beach chairs, umbrellas and coolers. Beautiful home in an even more beautiful location. Very close to the grocery store...a plus when traveling with kids. We will definitely be back. This beautiful home accommodated our group with ease! Clean, open, updated, and easy access make this a dream vacation stay. With everything from surf boards to beach umbrellas, snorkel gear to beach towels, we hit the ground running. We have vacationed in this particular home 3 years in a row. Plan to return again to this beautiful island. We had a wonderful vacation at this property. The reviews don't do it justice. The house is VERY well stocked with everything you might need for the beach (towels, boogie boards, surf boards, snorkeling items, beach bags, etc.). The kitchen also had all of the items we needed. We were a group of nine and all had more than enough space to have quiet time if needed. The layout is outstanding! The location is very close to a small shopping area which was wonderful for morning coffee or quick trips to the grocery. About a two mile beautiful walk to the beach. 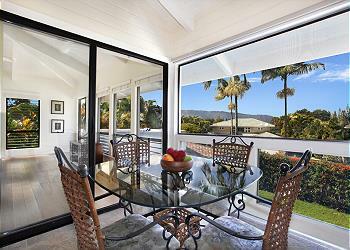 I highly recommend this property! Just got back from a weeklong stay in this beautiful home. We thoroughly enjoyed our time on Kauai. 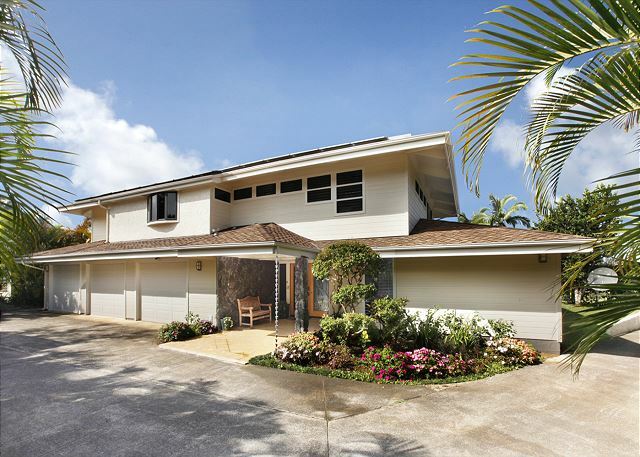 This home is located in a very nice area in Princeville , and close to many things that we did. Although we didn’t use the pool much, the hot tub was very nice at night after all of our hiking. This is an older home, that has been maintained and kept up very well. It had so many wonderful amenities that improved our stay nice. Especially the beach supplies in the garage. We had a great family vacation! The property suited us perfectly! We loved the backyard with the pool and Jacuzzi! The bedrooms were all nice sized. The location was close to the market. Our property manager Jason responded immediately to any of our request and was very hospitable! 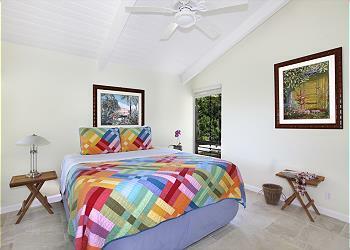 The property was also nicely located to visit the various beaches and hike to fabulous waterfalls. I would recommend this property for a large family. It was very comfortable and enjoyable stay. 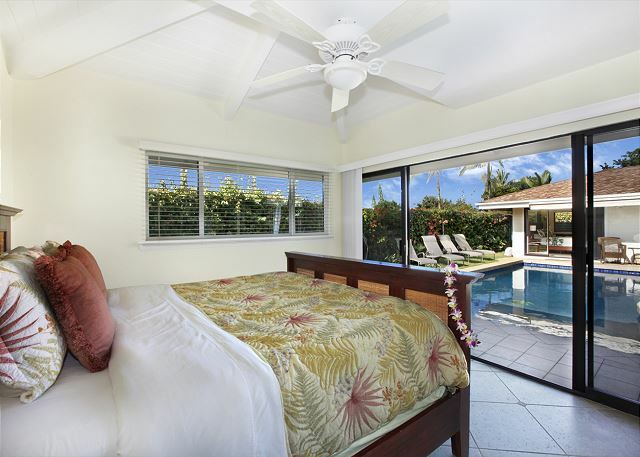 We have been to Kauai twice and have stayed at this house in princeville and have our third trip planned already This home has all the things we need to enjoy our vacation with up to 12 family and friends including beach equipment to use while we are there. 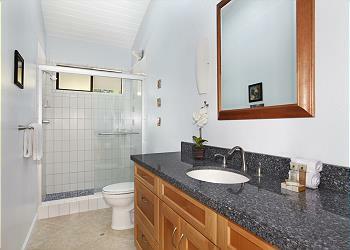 Location is good close to beach and shopping in a quiet neighborhood. A nice clean pool and hot tub also. And the property management is available and willing to help with any needs or problems that might come up while there. more than just a beautiful home away from home!! Wow. This house had it all, especially for a large group/family. Plenty of rooms for all to be comfortable to sleep, relax or be together. All bedrooms were spacious, clean, beautiful, comfortable and came with a gorgeous view of the pool, neighborhood or the mountains. Our favorite spot was the upstairs common screened-in patio. Gorgeous view and a wonderful breeze had us gathered there morning and night! 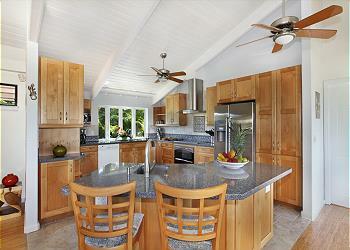 The kitchen was a dream, more than enough equipped with all you need, and updated very well. The kitchen table is a unique piece that I would love for my own! Plenty of bathrooms for everyone. And the well equipped and stocked garage with activity necessities neared for the beach made the beach days very enjoyable!! So convenient and easy. Thank you for a wonderful stay!! Jason, the property manager, was extremely nice, helpful, took care of our needs/concerns, and accomodating to us all. The beautiful pool was a great hit with kids and adults. Property was beautiful. After viewing the pictures of the house we were quite excited to actually see it and were little afraid it might not live up to our expectations. From the moment we opened the door we were in awe. There were 12 of us (7 of whom were children) and we all had space to get away from each other, to get a good nice sleep and have privacy the bathroom. The pool provided activities for the children when we were not at the beach or participating in some activity. The garage was well stocked with equipment to take to the beach and the kitchen had every appliance or cooking utensil that we could possibly need. It was very convenient to have the shops and playground in walking distance. It is the perfect holiday house anad we felt quite at home. We loved this place! 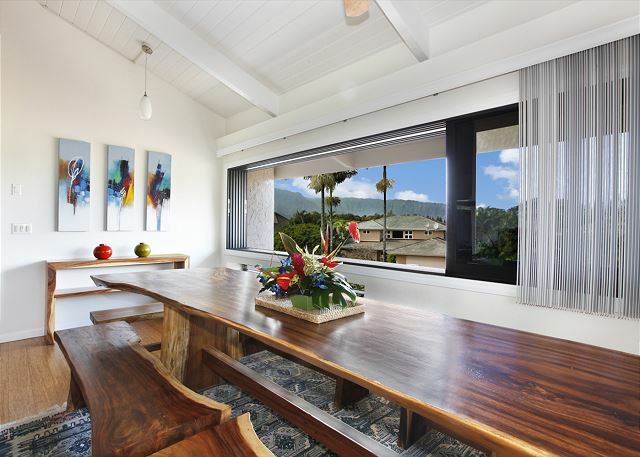 Great spot in Princeville on the north shore of Kauai, super close to the town of Hanalei with the shops and that amazing beach. We were here for a little over a week and had so much fun hiking the Na Pali trail, snorkeling at Tunnels, and exploring all of the local beaches in the area. The house had everything you need for a family and the layout of the house was perfect to allow us all to spread out comfortably. The pool and hot tub were a bonus and we loved all of the extras this house had like all the beach toys and kitchen amenities. Kauai Exclusive was easy to work with and the property manager for the house, Jason, was awesome and super helpful. It was hard to leave but I know we'll be back. I took my whole family and my wife's parents here for vacation and it was absolutely incredible. The house was perfect for all of us to spread out and enjoy ourselves. All of the beach toys, like the stand up paddle boards, surf board, some boogie boards, snorkel gear were here waiting for us. The back yard with the pool and the hot tub was private and well kept and the property manager, Jason, was always available and super quick to respond when we had any questions . We're so happy we were able to stay here for our family vacation and I can't imagine it getting any better. We're coming back for sure! 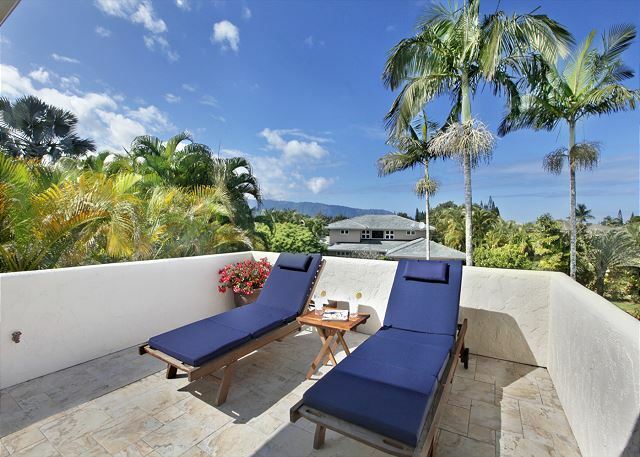 This is a beautiful family vacation home with two of the 5 bedrooms on the pool and hot tub deck. All bedrooms had queen or king beds which was not the best for children. One bedroom should have twins beds. Kitchen was the best, sooo well equipped- perfect. Pool toys were plentiful boogie boards,paddle and surf boards,coolers, deck beach chairs. Jason, the property mgr was wonderful, so helpful and informative. So quick to respond to our inquiries. The house needs work, paint peeling around windows, window coverings in bad condition- no privacy since there are missing panels. Floors need a good machine scrubbing... floors very dirty. All fan blades also very dirty with spider webs. We are a family of 14, including a toddler and a baby. This house was a perfect place for us to vacation!! Just returned back from an incredible stay at this beautiful property. Can't say enough! I traveled with my wife and kids and wife's parents and this house provided ample space and comfort. They have everything you need for the beach with stand up paddle boards and snorkel gear, even beach chairs and umbrellas. There are a lot of things within the kitchen itself that really made our trip feel like we were at our home away from home. They have everything you can think of from a rice cooker to a crock pot to all the spices and olive oil. Really nice to not have to buy that at the store. Having our own personal pool was a real plus and helped entertain the kids and keep them happy. Kauai Exclusive was easy to work with and the property manager (Jason) was extremely helpful and always available for anything we needed. We can't wait to come back! What a great place to enjoy Hawaii and a large group of friends. The house is set up perfectly to provide everyone with privacy and a communal experience. The house was super clean with all essential items provided. With an amazing array of beach items, chairs, bags, paddle boards, you name it they have it. Highly recommend!! We had a family group of 9 people. Plenty of room for everyone in this gorgeous house! Easy to get to beaches, restaurants and shopping! Jason (property mgr) was very responsive to questions and was quick to return texts. EXCELLENT. I had dealt with a few other companies that were dis honest and hard to deal with over e-mail/phone; however, Kauai Exclusive was completely different. They were great. Would highly recommend this company. Great location. Great house. It was nice to be able to cook in, relax and enjoy the scenery. Overall great experience! Jason was great to work with! We stayed at Nalani Palms with another family for a little more than a week. Could have stayed much longer. In the past we've always stayed at smaller 2-3 bedroom condo's or at Hotel properties. This house had everything we needed. 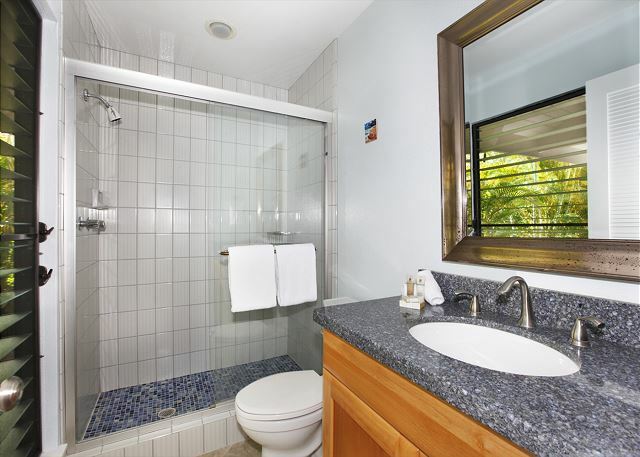 Double washer and dryers, great kitchen, rooms were spread out enough for privacy, pool and hot tub were great, 3 min walk to the market, ping pong table and game room for the kids. Just a great overall experience. There were enough ceiling fans and windows to keep the house nice and cool. Jason left us a huge basket of local fruit and snacks and was available for any concerns or questions. We definitely look forward to coming back next year. Thanks guys. We thoughly enjoyed our stay at this house. we had a few issues that occured while we were there, and a quick call or Text to Jason our property manager and everything was taken care of. The propery was well taken care of and the garage full of beach equipment put this rental over the top for us. We are looking to revisit in the near future with this house as our first choice. Our appreciation and thank you to the Kauai Exclusive Managment and to Jason especially. Our stay in Princeville was incredible. 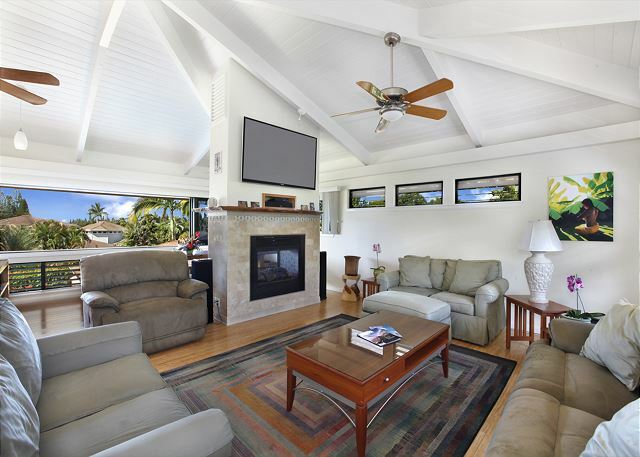 The Nalani Palms home is a beautiful, spacious, comfortable, fully stocked, joy to wake up in as the birds sing and the sun rises. Anyone who stays here will be very very happy. Jason, our property liaison was prompt, friendly, knowledgeable and an all around good person. What an amazing home for a perfect vacation! 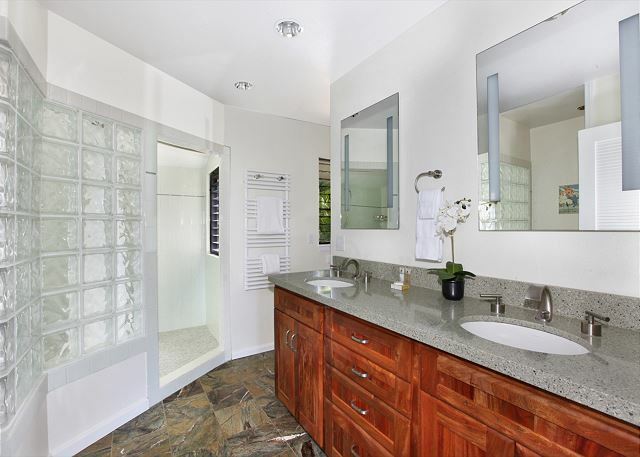 The floor plan of this home is great for privacy for all that are staying in the home. Beautiful is an under statement! The home is well kept and clean, extra clean and I loved that. Every drawer in the kitchen was well thought out with all the right equipment to cook and prepare our meals. The attention to detail was appreciated and made for an extra special time in Kauai. We loved the extra beach chairs, paddle and bogie boards, umbrellas, and ice chests in the garage. The extra fridge in the garage was helpful too, great for drinks down stairs by the pool. We can't wait to return!! 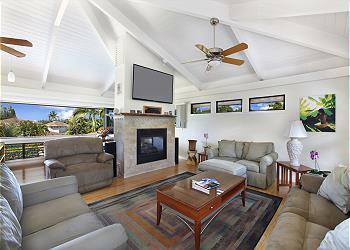 Aloha and Thank You for sharing this fantastic home with us. A special shout out to Jasen and Thomas for helping with the home and all our activities! I wanted thank Jason for being on top of things. We had one minor glitch as a shower plugged up and he was on top of it right away. And the late check-out was great. Thanks! Our family of 4 had a wonderful week stay in February. The house was very spacious and impeccably clean. The owners have supplied some outstanding value with a garage full of toys like boogie/paddle/surfboards, beach chairs and umbrellas, snorkel gear and kids sand toys. Inside, the ping pong table, Xbox and theatre system kept the fun going when we weren't out exploring the island. The local manager Jason was a great guy with prompt attention to some minor issues and questions we had upon arrival, one of which was the hot tub temperature. This, unfortunately, is heated via solar so only became warm (not hot) around noon until the sun went down. With the pool temp in the low 70's, it would have been really nice to have a heated tub to warm up in. But that's the only negative thing in the place. The location is fantastic in a very quiet neighbourhood. You can walk 2 minutes to the mall for groceries, takeout food, or get Lappert's ice cream and sit at the lookout just over the highway. 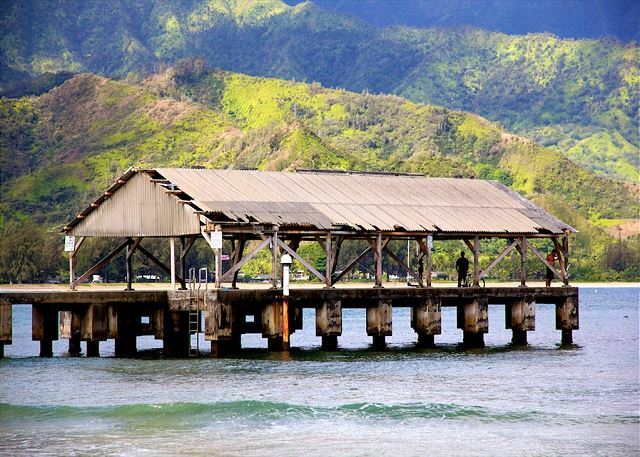 The fish market next to the Dolfin restaurant in Hanalei was our favourite place to "catch" supper, which we cooked at home daily in the well stocked kitchen. The Thai takeout restaurant in the nearby mall was excellent as well. Overall, we would recommend staying here for anyone looking to explore the north part of the island. It was a luxurious home base. FIVE stars for Kauai Exclusive and the Nalani Palms! We just returned from a 5-day stay at the Nalani Palms and we're already trying to find an excuse to return. 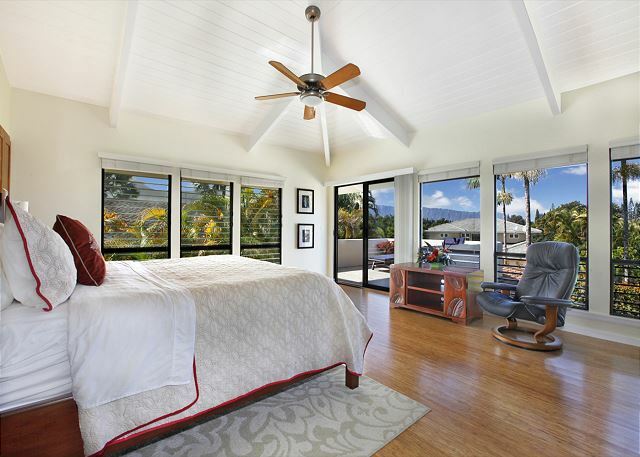 We loved everything about the experience: Josh and the Kauai Exclusive team, the property, the location. 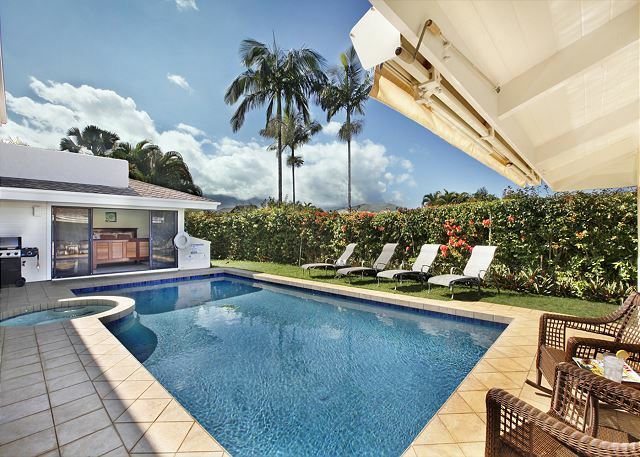 The house is a new rental and Josh's team has lovingly prepared it as a luxury vacation rental for even the largest groups. Everything was new and/or in great condition. There were five of us but we can see the house being comfortable for up to 10 adults (as long as two bedrooms don't mind sharing a bathroom). Josh and his team were incredible rental agents. They were available (via phone, text, email) for every question or hiccup, before, during and after our stay. Before we arrived they had a concierge service reach out to us. Sonja and Thomas gave us great activity ideas (private boat tour of the Na Pali Coast and the ATV tour at Princeville Ranch) and also answered questions about the area. 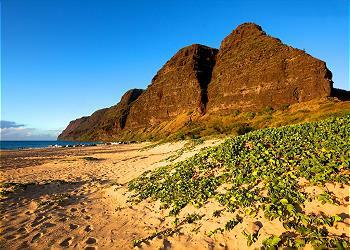 The house is located on the north shore of Kauai. 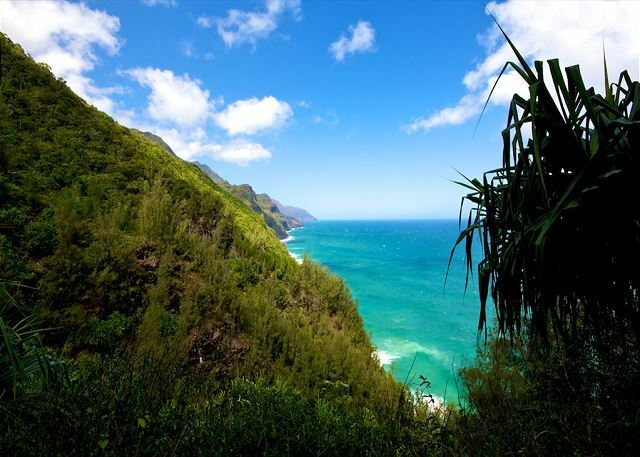 You’re located within a short drive to Kilauea Lighthouse (20 minutes to the east/south) and the Na Pali Coast Trailhead (40 minutes to the west/north) and everything in between. While we never left the north shore, you could feasibly do day trips to the south shore or Waimea Canyon. The airport is about 45 minutes away, a straight shot on Kuhio Highway. 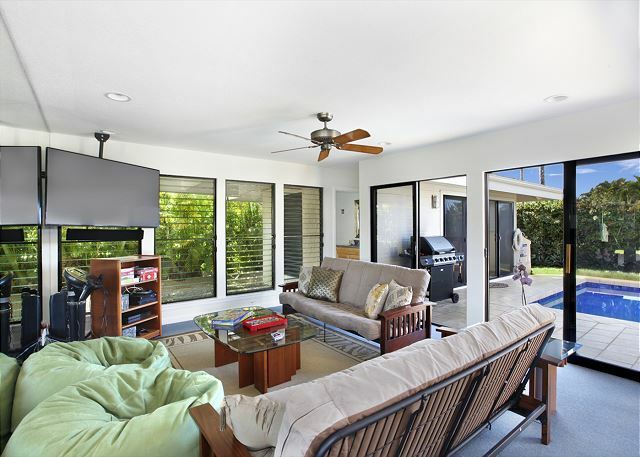 The house comes fully equipped with everything you could need/want for a beach vacation: boogie boards, stand-up paddle boards, life jackets, chairs, coolers, towels, videos, board games- everything! We rented our snorkel equipment from Pedal’n’Paddle at the Hanalei Shopping Center (you MUST snorkel at Tunnels Beach). The house is great- all 5 bedrooms were comfortable and spaced out nicely. 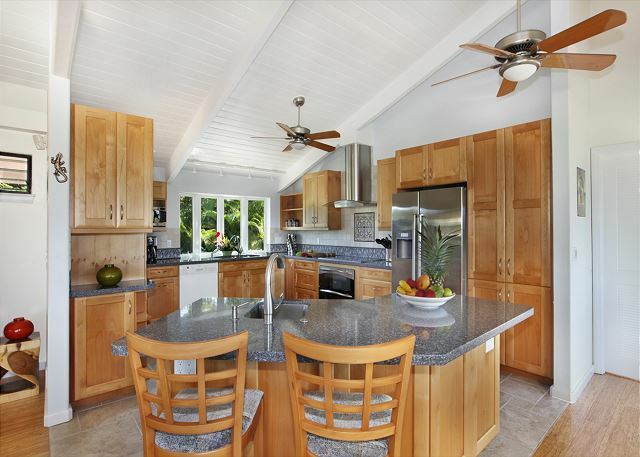 Common areas were well planned, the kitchen is wonderful if you have someone who likes to cook. It’s fully stocked with Tupperware, etc. You will not find a better house on the island.